While Facebook Messenger will still highlight recent conversations up top, newly-added sections display favorite contacts, any friends with birthdays, and an "Active Now" list of people currently online. The updated homescreen can be accessed at any time by tapping the Home tab at the bottom of the app, or a link that will sometimes appear in the top menu bar. Facebook hasn't said how quickly the rollout will take place, or even which platforms are initially being supported. Official screenshots all depict iPhones so far, however, and the company has traditionally preferred iOS when launching new mobile features, even if they ultimately come to platforms like Android. iOS 10, launching this fall, will transform Messages into something more like Messenger. Whereas the iOS 9 Messages app leaves conversations relatively static, iOS 10 will incorporate things like animations, stickers, and link previews. It will also support third-party app integration, for instance allowing people to send money via Square. The new app will put a bigger emphasis on emoji, and even include Facebook-like reactions to messages, such as thumbs-up and thumbs-down symbols. 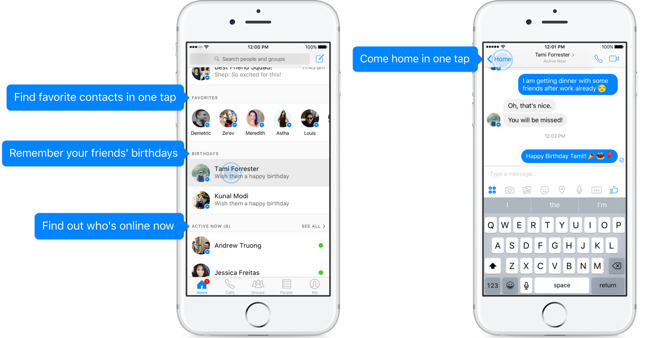 Facebook Messenger is a free download for any device running iOS 7 or later.